Do you ever feel like there’s just too much information these days? It can be difficult to know where to put your focus when life, work and the internet seems to pull you in every direction. Beating overwhelm means knowing where to put your focus and attention. You can’t possibly consume all that content – and you shouldn’t try. When you know what you’re trying to achieve , set very clear goals for yourself, and  hold yourself accountable for achieving them – you’re that much closer to beating overwhelm. You need to cut through the fluff and work out why you’re doing what you’re doing. In today’s solo show I’m giving you 6 steps to follow if you’re feeling the information overload. If one of your goals is to achieve a better work-life balance these tips could help you along the way. PS. This is an audio-only podcast. Please take this opportunity to click here and subscribe to my podcast on iTunes using the Podcast Player on your phone. Get into the habit of listening while you’re driving, walking, cleaning or cooking! You're listening to Tim Topham TV, the piano teaching podcast, and this is episode number 69. Hi, everyone. Welcome back to another episode of Tim Topham TV. Thank you so much for taking the time out of your day, your very busy schedules and lives, particularly at this time of the year, to listen to what I hope you find is a very, very important recording and one that you hopefully get lots and lots of value out of. Now, I'm on my own today and it's just an audio-only podcast. And today I'm talking about six steps to beating overwhelm. And by overwhelm, I mean that feeling that a lot of us have, and I think it's probably becoming more and more common, of just never being able to keep up with all the stuff that is going on, particularly online. And the reason I decided to record this episode is in the space of a week, I received two emails from my members with exactly this issue. And so, I thought I'd just read the two emails. Well, bits of them, anyway, without saying who they are but just to see if you share from some of the same feelings. I certainly do, I totally get it, and that's why I wanted to give these, not just the two people who emailed me but everyone who's listening some tips to coping with that feeling of overwhelm. So the first email said, "I'm enjoying being part of the Inner Circle. I'm also a member of other member sites and groups but I find it very hard to keep up with all the online conversations and activities. I've learned a lot from both communities but I don't want the computer to take over my life. Probably why I don't get involved more." So that was the first one and there was some other comments and things around that. And a second person separately, again in the same week, said, "I have a dilemma. I enjoy your podcasts, etc. very much. However, I over-extended myself by joining three different sites, which I have to pay for. I'm just not able to devote enough computer time to all of the very informative and inspiring people on a regular basis. And it's not just about money, it's really about the time. I get, you know, Leila Viss's blog, I get things from Bradley Sowash and Carol Matz, and Facebook groups, and Elena Cobb and Melanie Spanswick, and Jennifer Foxx and Debbie at Easy Piano and Diane Hidy and Noa Kageyama, Wendy Stevens, JoyTunes, the list just goes on and on. Oh, and I bought a sub to Piano Bench Magazine which I haven't even had time to read. Overwhelmed? Yes. I teach full-time, I have two vans and somewhere along the line ought to practice myself. "Funny thing is, I taught for nearly 25 years before I ever got a computer, then it took me a long time to even look around at all the teachers online. And in the last three years, I've spent so much time reading and looking around. And it turns out that there's a lot of overlap. And yet, I keep thinking, 'Everyone's got better ideas than me, I'd better read this one more blog, open this one more email, another article.' In some ways, I'd be fine if I just unplugged from it all now. I do enjoy your podcasts and I like hearing the conversations but lordy, there's so much stuff." So that was the email that really got me thinking about today's episode. And I have to say that at this time of the year, with all that's going on, I could easily suffer from overwhelm as well. As you know, most of you, I teach full-time as a Head of Keyboard in a college over here in Australia, Melbourne. I also teach privately and I run my online business, which is my member site, this podcast, and the blog. And doing all of that is exhausting. But there are a number of tools that I've been using, tactics that I've had that have allowed me to do what I have been able to do while I've been teaching full-time. So I guess the real problem is that there's actually now too much information around, isn't there? We've got these fantastic Facebook groups, they're brilliant. We've got many, many more people blogging than there was when I started, back seven years ago. We've got, yeah, endless amounts of TV to watch. TV series, you know, there's so many TV series everyone says are really good. Never get any time to watch them. And then, of course, we've got social and family life. And you know, it's such a shame, obviously, if that is the thing that starts to get encroached upon because we're trying to do too much of the other stuff and we're just feeling completely overwhelmed and perhaps even getting a little bit burnt out. Interestingly enough, you know, there's lots of great ideas. You know, for example, music learning theory is a concept that we had a whole month focus on in the blog this year and it's been getting a lot of interest in my community. You know, people are asking about how they get started, what are the resources, all that kind of stuff. And you know, it's a great concept to be teaching with a real audio focus right from the beginning rather than teaching a reading approach. So that's fantastic, you know, a really great idea. But the problem is if you keep on just trying out all these new ideas without actually setting yourself a course for where you're trying to go, then it's like a shotgun, it's a scattered approach that will actually really struggle to get you where you want to go, if you even know where that is. And we've got to remember, too, that if we're running a private studio we're effectively the CEO of our own business. And I hope that having had a focus as well this year on business, you've got a better appreciation for the fact that you're not just a piano teacher, you're a business owner. And unless you're thinking in those ways, you're really gonna be limited in the amount you can do and you're gonna be really stretched for the amount of time you've got because you probably won't be setting the right kind of goals and really focusing on some of those marketing and business plans. All right. So let's get onto some of my strategies for helping people. And some of these are the things that I suggested to the people who emailed me. Others are more general life tips. They're not all music-based because I don't think this feeling of overwhelm is all about piano teaching necessarily. It's about a whole mix of things. So my step number one is to prioritize your health and your sleep. I'm one of those wacky morning people. It probably goes with my cycling as well. I like being up early and I like doing some exercise straight out in the morning. I don't do that every day, but more often in the week than not. So if you're interested in my routine, I tend to...two days a week I will be up at 5:30 to be at the gym for an hour of weights on two days a week. And I tend to get up at about 6:15 or 6:00 to do two ride classes a week, so cycling classes indoors. And then on the weekend I tend to do a longer ride. I'm a bit crazy, so I could easily go three or four hours. So that's me with regard to my health. Now, a lot of you listening will probably go, "You know, I'm really not doing anything. There's just no time to do it." And of course, you know, there's only ever time for what you decide to give yourself time to do. It's whatever you prioritize, you'll have time for. If you've got time for chilling out on Facebook for an hour a day, then you've definitely got time for doing some gym or going for a walk or walking the dog or doing the housework, whatever it is that's gonna be keeping you nice and active. I'd actually recommend getting out of the house. I think one of the simplest things you can do if you're not into fitness and health particularly but you know you should be is to just walk. And one of the best things to do while you walk, to pass the time, is to listen to podcasts. I listen to lots and lots of podcasts I'll tell you about later on. I think listening to podcasts, or just listening to the audio of video recordings or courses that you're watching, whatever it is, just listening as you're walking is a fantastic thing to do. It gives you focus, it gives you ideas, it can help give you inspiration and you're getting exercise at the same time. Now, of course, that might not suit everyone. Plenty of people might just like to unplug and just chill and enjoy the surroundings and nature. So up to you, but I want you to prioritize your health. And let's talk about sleep, too. You know, trying to get up at a similar time and get to sleep early is so important. And I recommend it. Unless you're a gigging musician that's having to go to bed at 2:00 in the morning, try and get to bed before midnight. Preferably get to bed by 10:00 because there is countless amount of research out there that says the quality of sleep you get between 10 p.m. and midnight is a huge factor in your health. There's something about that time before midnight when your body has its best chance to recover and rebuild. So if you are constantly going to bed after midnight and you're perhaps feeling tired or getting sick more than usual, this could be something to consider. How do you go to bed earlier? Well, the best thing to do is exercise because that makes you more tired and try and get up earlier. I'd also really encourage everyone to focus on their nutrition and drinking a lot of water. So while I'm actually sipping a coffee as I record this podcast, I restrict myself to one a day. I drink a lot of water. Water, water, a lot of water. I love water. And I eat a really balanced diet. I don't follow diets as much as just being reasonable. Everything in moderation is what I say. All right. So that's about health and sleep, that's number one for coping with overwhelm. Alright, number two, so important. Focus on what's important. We really have to narrow our focus. And just because something out there is a good idea or just because someone's writing a great blog doesn't mean that you have to do it or read it or enact it, because it's got to be down to your philosophy. As you know, I've been running some workshops around Australia with my good friend Paul Myatt. And one of the things we do at the start of the workshops is to help teachers set their philosophy or at least start thinking about it. It's one of those things that if you never give yourself time to do it, you'll really struggle to ever know where your direction is. So the question I ask people is, "What do you want your students to be able to do when they're finished lessons with you?" So picture a student that you've got who's maybe eight, maybe just starting to learn now. When they're 18, they've been learning from you for 10 years and they're going off to do whatever, college or whatever it is, what would you love for them to be able to do? And we categorize that into a few different categories. What kind of performing skills might they have? What about their listening? What about reading? What's their theory skills like? What about their creativity? What about their approach to practice? If you have a think, just for a moment, and try and come up with maybe three things that are really important, that you believe your students should really need and you would really love them to have when they finish with you, then this is starting to narrow your focus and get your philosophy sorted out. So if you would love for your student, when he or she is 15, 16, 17, to be able to play in a band with a bass and a drummer and a guitarist and just be able to groove along and try and make up their own music, then one of your philosophy, one of your passions for teaching, has got to be to do with creativity and improvisation. So the question is when we look back to now, what kind of blogs, podcasts, courses and things are you looking at that is gonna help you teach creativity and improvising in the best way possible? Is it a blog about performance anxiety? Well, maybe not. Maybe, actually, that's not that relevant to you at the moment. Maybe you should be focusing more on building up some of your creative teaching skills. Maybe you would really love for your student, when they get to 18, to be able to understand the theoretical connection between harmony and melody in the structure of music. How are you gonna get them there? Maybe you want them to be 100% independent practicers. Maybe you want them to be the best sight readers on the planet. Whatever it is, that's gotta dictate where you're going. For me, it's a little bit like having a train. You remember those locomotives that used to have turntables? I remember, maybe from "Thomas the Tank Engine" days, and to turn the train to face the other direction on the track, they'd put it on a turntable and spin it around. At the moment, and if you're feeling like it's a bit overwhelming, all this information out there, you're a little bit like that locomotive going round and round in circles on the turntable. What we need to do is decide on the direction you're gonna take and start laying tracks in that direction. And that can only come if you set aside the time to think about your teaching philosophy. What are you trying to achieve? So that's number two. Focus on the important thing, start to narrow your focus, decide what you're trying to achieve for your students in your teaching. Step three or idea number three, set goals and develop a plan. And this is gonna be for music and business and life because, for most piano teachers, they're pretty intertwined, aren't they? We work from home, you know, our lives are very closely related to our business and our work. So what you must do is start setting and actually writing down goals, develop a plan. This is how you cut through the over-abundance of information out there. And I would recommend doing weekly goals and perhaps monthly or a couple of monthly goals. So a short-term goal. You know, if you're getting lots and lots of blogs and they're all in your inbox and they're all unread emails because that's how you're managing your to-do list, and you're just like, "I can't. I don't know what to do," maybe a short-term goal for you would be to set aside an hour by, I don't know, five days away, three days away, to skim-read all the latest blog posts from your favorite bloggers and make a decision on the top one or two to continue following, depending on what you decided for your philosophy and your direction. And simply unsubscribe from the rest. And that might be mine. You know, maybe my stuff isn't relevant to you anymore, that's totally cool. You've got to find what's relevant for you. You can always re-subscribe to things later on, unsubscribe from them now. There's even a little gadget that helps you unsubscribe from things automatically. I can't remember what it was called at the moment though but I'll pop a link in the show notes when I remember what it is. You could probably Google "unsubscribe from emails tool" or something. Okay, another short-term goal could be commit to 30 minutes of practice every day for the next week. No interruptions, no excuses, no misses. Thirty minutes of practice. You'll be amazed at the benefit that that can produce for your own peace of mind, your own productivity, your own passion. And each member of the Inner Circle gets to do this as one of their challenges, I think it's five hours practice in a week and the results I've been getting back from people have just said, "Oh, this is exactly what I needed. I just needed to set a goal and commit to it." And of course, having a community around you like the Inner Circle does help keep you accountable for things. So there's another little goal. Maybe you want to, you know, decide on whether you keep that Piano Magazine subscription that you never have a chance to read. Is it worth continuing to pay for that? And maybe you commit to going walking three times a week for one hour each day or something. I'm sorry, three sessions a week for an hour each time and going for, you know, a reasonably brisk walk. Maybe that's what you're, you know, short-term goals are. And then maybe your longer ones, maybe set aside an hour, two hours on the weekend to sort these key teaching philosophies. What are you trying to achieve for your students? Or maybe you need to set aside some time to start considering that, you know, you're really passionate about this idea of group teaching. Maybe you need to start now thinking about how you're actually going to incorporate that. Maybe you need to get some more space down the track, maybe you need to lease some space. Perhaps you need to start informing parents now that you're moving to this system, whatever it is. You know, think about your plan, what is your business plan for your studio? Have you got one? If you haven't, then that is something that in the short-term you should be starting to make a goal of yours. And you know, you don't need to spend a whole day doing it either. Business plans, or even if you don't want to call it that, maybe that's a little bit terrifying. Maybe just call it, you know, "Studio Goals." Just start jotting things down, what you're trying to achieve, where you wanna go. Because the best way to get there is to have a goal, obviously, but when you get up there you're gonna look back and go, "Well, look at the improvement I've made." Or not, whatever it is. So in regard this kind of goal setting, one of the features of Inner Circle membership is something we've called the "Growth Journal," and this is just an opportunity, a place in our forums where members can actually tell us a bit about themselves, it's their own place there, and then start setting goals which we can all follow. And I ask people who have taken the opportunity to do this to journal at least weekly and feedback to us about how they're going. This is the kind of thing, the kind of structure, that allows people to start narrowing their focus and to start moving ahead on that train track instead of spinning around on that turntable. So even if you're not a member, you could do this yourself. But of course with the membership comes a whole lot of support and a lot of people cheering you on from the sidelines, which I think is really important. I'd also just say one other thing when it comes to goal settings. And that is just don't try to do everything at once. Try one thing or two things at a time, in a week and see how it goes. I say the same thing when it comes to teaching ideas, you know, or using apps or whatever it is. Don't try and do everything at once. Just pick the right tool to get you where you wanna go and give that a shot first, see how it goes, feedback and then you can start again, you can start redeveloping your plans for the next goal. Okay. So that was step three, set goals and develop a plan. 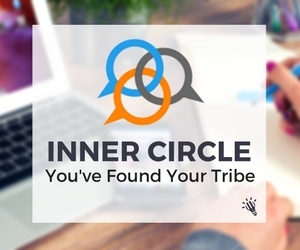 If you are a member of the Inner Circle, jump into the Growth Journal Forum and start working in there. I think it's gonna make a huge difference to you, particularly if you're feeling like you're going round in circles or if you're feeling a little bit overwhelmed. Okay, step number four is to get more productive. Now this, you know, it sounds a little bit funny, right? By productive, I mean being a bit more clever with your productivity. So there's a lot of ways in which you can streamline things that you do, particularly with regard to things that you'd use online. Take, for example, absentee records, if you've got a studio, maybe you've got some other teachers working for you. Rather than a very manual list or paper pages or something like that, moving to, maybe Google Docs or Google Sheets where you can share things with multiple people could be a really simple way to be more productive. If at any stage you're finding you're emailing things to parents every week after a lesson, you know, "Here's Johnny's notes from today's lesson," then you've gotta think, "No, that's just not productive," because there is a tool that will automatically do that for you and it's called a Google Doc. Google Docs, for those who aren't familiar with it, Google has a suite of applications just like Word and Excel, the Microsoft ones. They have online versions of those which are brilliant for sharing with other people. So, I, for one of my students that I have privately, we share a Google Doc which is his lesson notes. So I just type in them during the lesson and when he's at home he can look at them. He can type things back, we can embed things, he can share things with me. And it's all shared in one spot. I don't need to keep emailing things, I don't need to update anything, it all happens automatically. If you're interested in finding out more about this then I did a fantastic webinar with one of my expert teachers, Joyce Ong, who is a superstar in this area. It's called, "5 Top Productivity Tools for Piano Teachers," and it's a free webinar. It's available on my site, you can watch it right now if you want. It's at timtopham.com/events, and there's a few webinars there that you're welcome to take a look at but that is one that I would highly recommend. We got so much feedback about that. One of the other things we talk about in that webinar is a to-do or a list app called Asana, which is great. I've really started using it. Actually, Joyce introduced me to it and I've started using it more and more in my studio and my business and it is fantastic. Again, a great way to share things with other people. If you have someone helping you, perhaps, in your studio or if you'd like to do that, then this idea of being able to share things across multiple accounts and multiple people is a huge bonus and a benefit. So that tool is called Asana, A-S-A-N-A. Really good way to keep track of things that you need to do, and great way to set goals too, potentially. Okay. So that's number four, it's about being more productive with the things that you do, particularly things that are repetitive. You know, how can you do things more productively? Okay, step number five is to automate what you can using software. So for example, I often talk to teachers about billing, you know, studio scheduling and billing and tax time and all that kind of stuff. If you're fluffing around with bits of paper on your kitchen bench and shoe boxes full of receipts and things like that, then there are such better ways to do things, again, using online tools and software. One simple one that you could think about is Music Teacher's Helper. It's an app that I use to schedule my students and organize invoices. You can get paid through it, it'll do tax time reports, it'll email them reminders. You know, things like that, that just happen in the background without you having to worry about it, can be just fantastic. Practicia is a great app for helping with your practice, you know, replacing the practice diary or assignment book. There's many, many of them and I've listed my top ones in my resources page, which is timtopham.com/resources. And that doesn't even include all of them, I use a whole heap of different software and apps for managing all the things that I do online. For example, I've got software that controls and manages my emails. It's called AWeber. I have an app called CoSchedule, which hooks into my blog and helps me schedule all my posts and my social media and things like that. So if you're a blogger and you want an easy way to do that, then CoSchedule is brilliant. I've got a membership plugin for payment and memberships. I've heard of people, you know, selling e-Books online or books or whatever it is, and you know, manually taking money into their bank account and checking up, waiting until it clears and then giving someone access by sending them an email. You know, forget it. For the amount that it costs to use a plugin or some kind of way to automate that process, just do it. Take that off your hands, you don't need to be worrying about that. I use an app called ChartMogul, which is a subscription business statistics kind of app. So it shows me all my statistics for how my membership's going. I use Calendly. If anyone who's listening has been on my podcast, they would have been sent a link to Calendly, C-A-L-E-N-D-L-Y, [SP] which is an online app I use for scheduling so people can book time with me. And it all happens in the background and it just connects to my Google account and, you know, it's just brilliant, don't have to worry about it. And things like Hootsuite, which is a social media scheduling application. Now there's so many of them but what I would suggest you do is if you're finding you are doing repetitive tasks that potentially some software could help you with, or if you're finding you're feeling a bit disorganized because everything's a little bit old-school and on paper, then investigate what other people are doing. Start by having a look at my resource page and see what's there that might suit you. If you've got any questions, leave a comment under this blog post and let me see if I know of an application or some software that could help you, I'll definitely tell you about it. Okay, and my final tip for helping with this feeling of overwhelm is to outsource what you can. Now by outsource I mean hiring someone else to do it. And what I've found is that I simply could not have done all that I have done, with my podcast and my blog and my membership site, without the help of other people to do some of the things that I don't have time to do and that I shouldn't be doing because it's not really what really what my skills are in. So when it comes to outsourcing, I want to encourage you to consider outsourcing people online and finding people online. I use a site online called Upwork and what I've actually done is I've recorded a video, it's about 15 minutes long, of how I use Upwork in my business to find freelancers anywhere in the world and to find the right people and to hire them to help me out with jobs on my site. And you'd be surprised, it's actually not very difficult. So in the video, I actually show you the example of hiring a bookkeeper, which is something I finally did, made the choice to do about six months ago to take that off my hands. I don't know why I was trying to do my accounts, it is not my strong point and it's not where I should be spending my time. So I went on Upwork and I show you in this video how I actually went about hiring them. What did my ad say? What are some of my tips? There's some things you can easily go wrong with, so what to look for in people on there and so forth. So if you're interested in that, you'll be able to grab that as a download from today's show notes page which will be at timtopham.com/episode69. When it comes to hiring other people online as well, I would just recommend one of the ways to determine whether it's something someone else could do is, again, as I said in point number five about automation, if it's repetitive and easily replicable or something that you can easily demonstrate and something that you do every month or every week, then chances are you could be hiring someone for a lot less money than you charge as a rate to do that for you. So for me one of the first things I did was, when I started my podcast after a few months was hire someone to edit them, upload them, add them back into my blog so they link through to iTunes, all that kind of stuff. There was a whole process. And all it took for me to do, when I hired the right person, was to take a screen recording, so that's, you know, taking a video of me using my computer looking at the screen of me doing whatever it is that I need done and talking as I go, saying, "So I click here to start the upload. You need to select this, when you press this, da, da, da, etc., etc., etc.," and saving that and just sending that to the person who you've hired to do the job and they will hopefully be able to follow it. And if you get the right person and you record your screen-casting, your screen really well and you're very clear, there should be no actual issues with it. If you've never done a screencast, so that's a screen recording, it's really, really easy. I use software called Camtasia, which is available for PC and Mac. And there'll be a link in the show notes to that. And it's actually got a little brother, a little sister app called Snagit, S-N-A-G-I-T, which I use every day, pretty much, for something. Snagit is just a really quick, easy way of capturing something on your screen. So you might want to just highlight a little screenshot that's just popped up or you might wanna take a really quick video of something on your screen but you don't need the whole editing suite of Camtasia. Snagit, it's a great little tool. I use it all the time, couldn't recommend it enough. And then, of course, you could use something like Asana to actually list the steps in the order or a Google Doc, which you share with the person that you've hired. It's really, really in reach now. In the last 10 years or so, this whole world of online freelancing has exploded and it is really something that anyone can do. And you know, while you might only be paying someone overseas $10 an hour, maybe less, what you should remember is, of course, that depending on their country, chances are that will actually be helping them get a really good wage. Even though it seems perhaps for someone in the West like a really small amount to pay someone, they are very eager to help and do the right job and do things really, really well because they can support their family on what seems like a very small amount to us but allows them to be able to work from home and support a family. So you know, it's a great opportunity we have now, around the world, to hire people to help with whatever thing you need done. And I currently have people in Serbia, Philippines, Spain, a whole variety of places who help me with the work that I'm doing online. And I simply could not do it without them. All right. So they're my six steps. Prioritizing your health and your sleep has gotta come first. Regardless of anything else you get out of today's podcast, keep that in mind and please, please do it. You'll get so much more out of everything. I have a feeling that the reason that I can be so productive in all that I do is because I eat well, I sleep well, I'm never in bed after 10:00, very rarely, I'm up early, I exercise and I eat well and I drink a lot of water. That's really the key. I think if you're ever kind of thinking, and I get a lot of people saying, "I don't know how you do all this, Tim," well, there's a little sneak peek into my secret. So step two was to focus on what's important. Really narrow down and set your philosophy, work out where you're trying to go. And then number three was to set goals and to develop a plan, some short-term goals each week and some longer-term goals for each month. Step four was to consider watching the productivity tools webinar that I did to help you with some online resources that can help you get more productive. Step five was about automation. It was about using software that do things that you shouldn't be worrying about doing on paper. And step six was to outsource. So if there's not software available to do some repetitive task, then could you find someone else in the world who would be happy to do that task and do it really well for you and allow you to spend your time with your family, or you to spend your time practising, or for you to spend your time planning or teaching, or teaching more students, whatever it is? I read a quote just recently that said, "There's no elevator to success, you have to take the stairs." And I think it's really important to consider that in running any kind of business, and that's what we're all doing as independent music teachers, we have to have a resilient kind of mindset. You have to be confident in your abilities but you have to be sensible as well. And that's why I think we can all start, at this time of the year, thinking about our plans for the coming year. If you're in Australia, you've got holidays coming up. You may even have four weeks, four, five, six weeks, depending on the kind of place you teach and the work that you're doing. Over in the States, you'd have a couple of weeks, I would guess, between Christmas and when you go back in January. So this can be a great time to start planning what's coming up, to start setting aside that time to consider your goals, to consider your philosophy. And I have a feeling that I might just do a blog post on this whole idea of philosophy, or maybe even another podcast because it is just so important. For those in the Inner Circle, Joyce, who has done the productivity webinar, is actually creating a mini-course on processes and creating processes in your business to really streamline a lot of what's going on. And that's gonna be coming out in the new year. As a final thing, just before we wrap up today, I thought I would just share with you some of the goals that people have used in my online challenges, in my community. And when we have one of these, we call them "4 Week Challenges," and you might have seen the podcast that I did with Colin who won the first "4 Week Challenge," that was episode number 63, timtopham.com/episode63, how he grew his studio significantly by really knuckling down and focusing on a number of things in our last challenge. In these challenges, we tend to separate our goals into four areas, pedagogy, business, technology, and health, life and social. So let me give you a couple of the kinds of things that I suggested when we first started this that people might choose to set as goals. So under pedagogy, 30 minutes of practice time per day for you as a teacher. Maybe it's about moving around more during the lesson. Maybe that's about you walking around more and not sitting so much or maybe it's about getting your students moving around more during lessons. Setting aside time to listen to a podcast. Maybe learning a pop song chord progression. Maybe it's about exploring new repertoire at the piano and giving yourself 30 minutes a week to do this. Or maybe it's exploring a new exam board, if you teach exams and you've always been thinking, "Oh, I generally teach with one board but I've heard about this other one. Why don't I set aside an hour to investigate it, try it out, see what it is?" So they're kind of pedagogy goals. Examples of business goals, organize your studio policies, maybe start moving to Google Docs for storing these things so you can share them with other people. Maybe you'd like to set up a welcome pack for your new students that show an interest in lessons. Perhaps when they call, you currently kind of scrounge around for bits of paper and things to give people when they show an interest. Perhaps you could just say, "Here's the email address, please email me," and you can respond and just give them a link to a Google Doc that's always the same for every student and you know they've got the same information. You could do the same thing with your policies. Maybe you need to start a marketing plan, maybe you need to read a business book, create a Facebook page, try some Facebook advertising, maybe set up a Pinterest board. These are all the kinds of things you could do in the business section. Under technology, maybe it's about setting up a YouTube channel, finally. Maybe it's about recording some teaching videos. Maybe it's watching a mastermind or a webinar that you've been meaning to watch. Maybe you actually need to use the iPad that you bought, that you still haven't had the chance to use yet. And maybe limiting Facebook to 10 minutes a day. And in health, life and social, you know, perhaps you could move towards not scheduled students on weekends. And some of you are probably laughing at that, like, "Oh, I couldn't possibly do that, you know, I wouldn't make enough money." Well, maybe there's an opportunity there to spend the weekends with your family if you could cut back, and perhaps you could move to more of a group teaching process, perhaps. You know, definitely, think about it. A number of teachers set that as a goal earlier this year in the Inner Circle and have achieved it and they're incredibly thankful for having their weekends back or at least one day of the weekends if they were teaching both. Maybe it's about some meditation. Maybe it's about saying three things you're thankful or positive about every morning when you wake up. Maybe it's about finding some new recipes for healthy food, and preparing and planning earlier in advance so you don't go for the cheap snacks. Perhaps you should reduce some caffeine. Maybe get more active. Maybe avoid screens in the bedroom. Maybe eat more fish, drink more water. I don't know, whatever it is, floss, get your eyes tested. Whatever it is, you know, these are things that we just don't give ourselves time to think about in the busy-ness of day-to-day. And that's why I've thoroughly enjoyed the work that we've done in our live events because you get that time with a whole group of people that are really passionate and we just can check out of reality for a day and focus on ourselves and our businesses. And I hope that you can do the same thing with regard to this. If you're feeling a little bit overwhelmed at the moment with everything that's out there, I want you to really stop, set aside some time to get organized, because I know you're gonna be more productive, you're gonna achieve more, your students are gonna get more out of you because you're not gonna be stressed, you're gonna be able to devote more time to your family and hopefully you'll be able to build that studio that you're really looking for. I hope today's episode has been useful to you. Again, if you're looking for show notes, they're at timtopham.com/episode69. It's been a pleasure talking with you and I hope if you've been having a little bit of a walk today, well done, while you've been listening. If you've been doing the housework, I often do the cooking, actually, while I listen to other people's webinars. Whatever you've been doing, I hope you've been productive. And until next week, all the best with your teaching. Did any of today’s tips help you see something in a different light? What’s your overarching teaching philosophy? What do you do to stay healthy and feel balanced?